John Sauvarin 2016 – Leongatha Cycling Club Inc.
Family, friends and Club members at this year’s memorial ride. The Leongatha Cycling Club extends an invitation for any social cycling groups to come and join the rides with our club members. This year a 38km road ride around the “Pound Creek circuit” or a ride /walk along the newly opened Black Spur section of the rail trail to Meeniyan (8km). John was a highly regarded life member and each year a social ride is held in his honour. As an Electrician gave his time on the installation of the Velodrome lights in 1980 and the running of the Track Cycling Carnivals. John’s talent as a rider become evident as a Junior in 1968 and has figured in many Club titles. 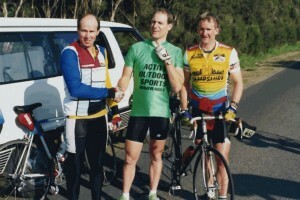 A Member of the Victorian Senior road Team at the National 180km Championships 1981 in Tasmania and 1982 in Brisbane. ‘Sauvie’ was an all round Club ‘good guy’, tragically losing his life in April 2006 – due to medical complications.